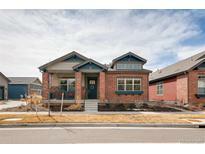 Below you can view all the homes for sale in the Stapleton subdivision located in Aurora Colorado. Listings in Stapleton are updated daily from data we receive from the Denver multiple listing service. To learn more about any of these homes or to receive custom notifications when a new property is listed for sale in Stapleton, give us a call at 720-729-2338. Don't miss this opportunity to call this stunning home yours! MLS#7876794. HomeSmart Cherry Creek. California Closets also are installed in the oversized clean & organized garage. MUST SEE! ! MLS#5758880. Keller Williams Realty Downtown LLC. This is truly an exceptional home! MLS#1874302. ERA New Age. This home has it all: a private yard and patio, an oversized 2-car attached garage, and a full basement ready to be finished! MLS#2665166. Focus Real Estate. ***Other upgrades: Kitchen Aid Double Oven Gas Range (Stainless Steel), Kitchen Aid Under Cabinet 600 CFM Commercial Style Hood, Ceiling Fan Pre-wire in all rooms, Rough In Plumbing in Basement, 50 gallon Water Heater, Jet Tub in Master Bath, Corian Counter-tops in Kitchen and Master Bath*** MLS#8585861. MyCore Properties. Move In June 2019. Photos of Model. MLS#5135390. WK Real Estate. It is rare to find a home at this price with a finished basement which affords a sizable family room, bedroom, full bath, & excellent storage. What value! MLS#7850364. Focus Real Estate. Great location convenient to the medical center and new VA hospital. MLS#3522965. CREEKSTONE PROPERTIES. *Home is Under Construction. Move In Summer 2019 MLS#6592685. WK Real Estate. *Photos of Model. Move In Summer 2019 MLS#6570634. WK Real Estate. What are you waiting for… free time is waiting for you in this Spirit home. Move In Spring 2019. MLS#9086681. WK Real Estate. Great location convenient to the medical center and new VA hospital. MLS#3998305. CREEKSTONE PROPERTIES.